The pitches range from 16 to 100 m² and are attributed depending on the number of people. 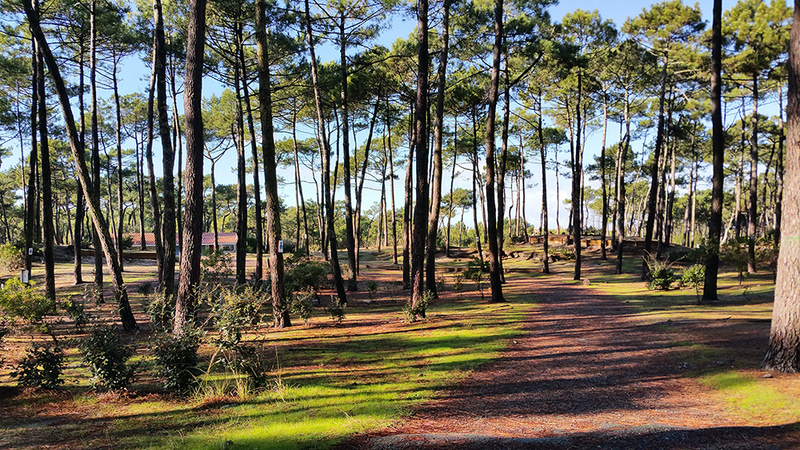 Most are in the shade of over twenty year-old pine trees and bordered by hedges. Some higher or very sandy pitches are exclusively for tents whereas others can receive caravans or campervans. 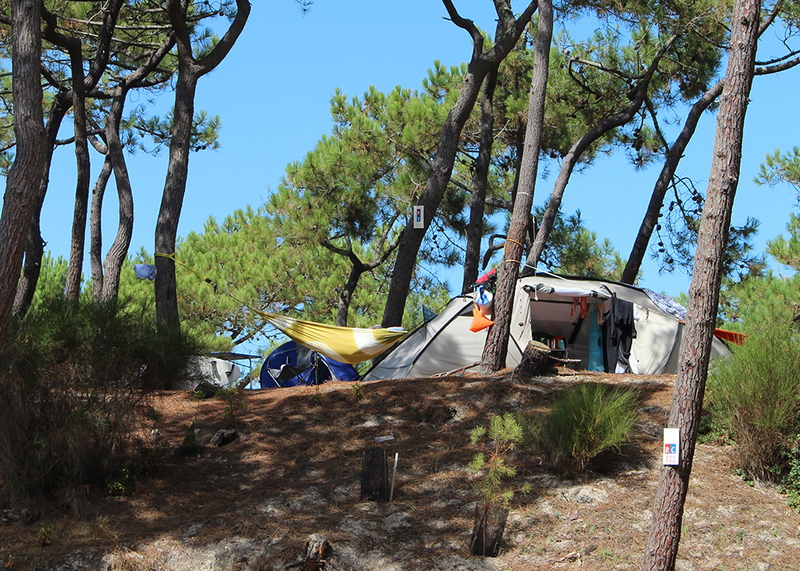 On our campsite it’s the natural environment which guides us ! So for your reservations, it’s absolutely indispensable to specify your material. Arrivals are from 2pm and pitches must be vacated at 12pm. (consult our opening hours). 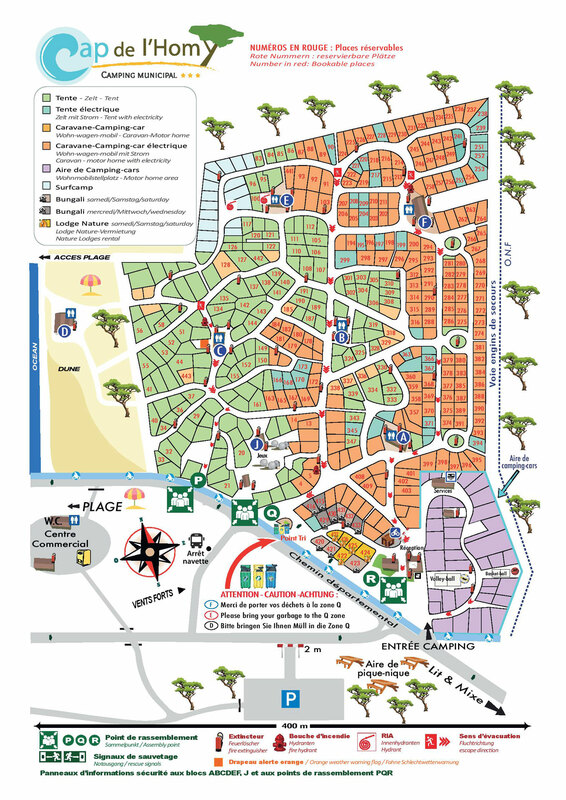 Because of the nature of our terrain, our pitches are divided into different categories. We draw your attention to the fact that some higher or sandy pitches are inaccessible to caravans and campervans ➔ When reserving, be sure not reserve a tent pitch if you have a caravan. 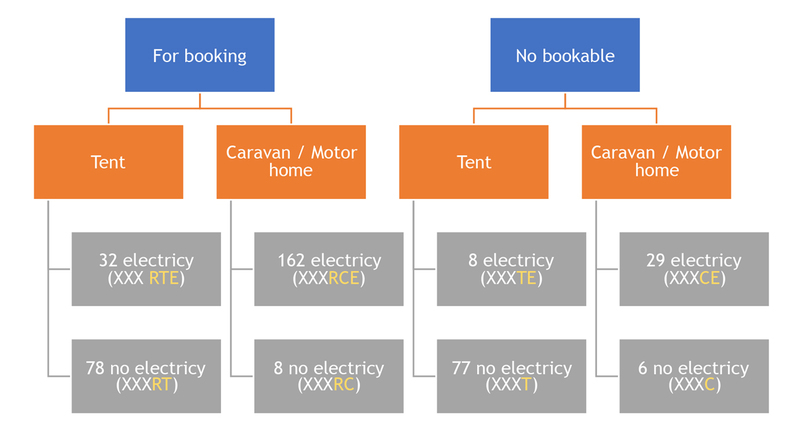 For example, pitch number 180RCE is N°180, by reservation, for caravan or campervan, with electricity. Number 323T is a tent only pitch, non-reservable and without electricity. For folding caravans: in this case, select the « caravan » category in order to have a pitch which is accessible for your equipment. Booking fees are 30 €, non-refundable in case of cancellation. With a reservation, dates and pitches are firm : you cannot change the the pitch which has been attributed to you and should you arrive late or leave early you will be required to pay for the number of nights reserved. (see our T&C’s). 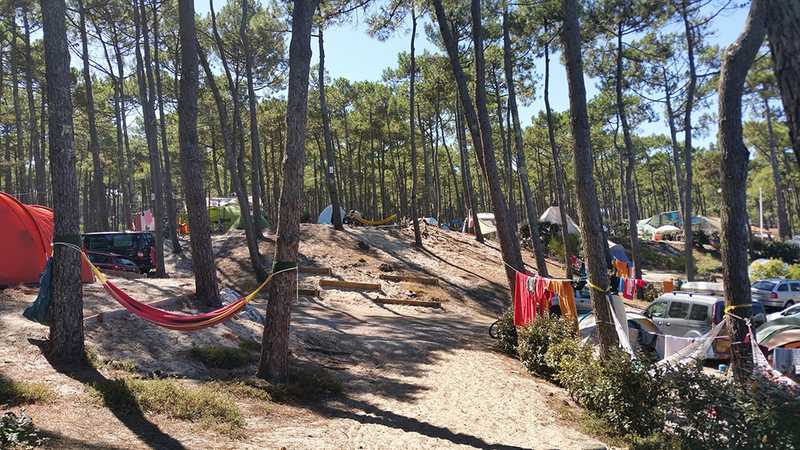 The campsite is often full with a very high demand from around the 14th July until the 25th of August. It is therefore highly recommended to make booking for this period. Remark 1: during the season we give priority to booking requests of a minimum of 7 nights due to booking fee and planning constraints. Remark 2: on site, should a ‘reservable’ pitch be available it is possible to obtain one (most likely at either end of the high season) but this depends on it being suitable for your equipment. It is however, impossible to book a place which is categorised as ‘passing through’. Opening of bookings: You can find the date of bookings opening on our website, usually in the autumn. (The 2018 season’s bookings were opened on the 15th January at 10am.) It is possible, depending on availability, to make a booking until 30th June. Due to the high number of booking requests and the very short payment validity, we are occasionally forced to open the bookings service intermittently. The « windows of booking opportunity » are displayed on the website home page. Requests are all dealt with by order of arrival. To get your favourite spot, we advise you to reserve even for the low or middle season. There is however, no guarantee that you will get it and you won’t know which pitch has been attributed to you until after you have paid the deposit. Many of you come as a group of several families or friends and ask to be placed together. Be sure to fill in a request for each family as we work on a 1 family= 1 reservation = 1 payment basis. But beware, our booking system isn’t able to manage group bookings so you may well end up separated, or the booking may not be accepted for everyone if there is no further availability. Some ‘passing through’ pitches (without reservation) are also offered depending on availability. They are attribued depending on the sort of equipment, dates and number of people (and not by the size of the equipment). In the peak season (from about 15/07 to 25/08) they are in high demand and very few are freed up each day. We advise you to have a plan B in order to avoid long queues. In this case, select the “caravan” category in order to have a pitch which is accessible for your equipment.